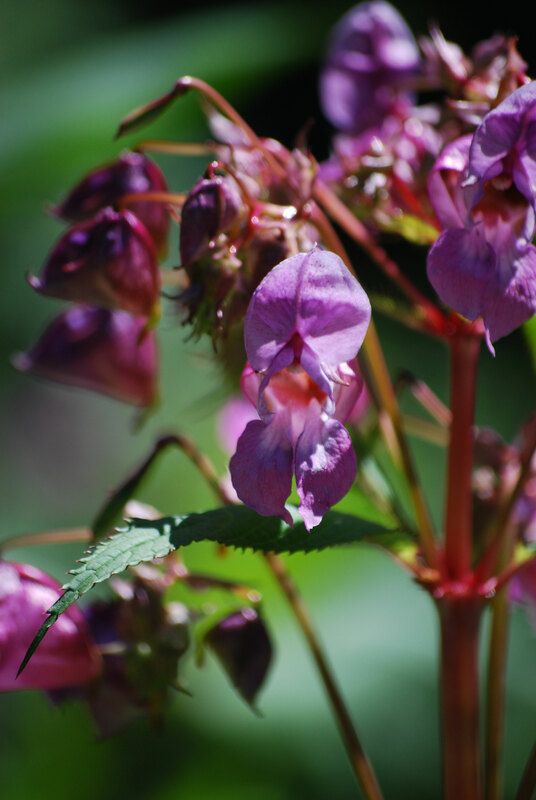 Policeman’s helmet (Impatiens glandulifera) is an invasive weed which grows in ditches, wetlands, and along waterways. Native to India, this fast-growing annual was introduced as an ornamental plant due to its impressive growth and the showy purple, pink or white blooms. Since introduction, it has escaped cultivation to become the dominant riparian vegetation in many areas. Policeman’s helmet germinates in early spring and can grow up to 10 feet tall! The large, upright, reddish stems are hollow and topped with dangling tubular flowers in showy clusters. Leaves are oblong with serrated edges and a reddish tint. A single plant can produce up to 800 seeds which are easily carried downstream in flowing water, to start a new infestation. Mature seed pods split and propel seeds up to 20 feet away. Policeman’s helmet spreads very quickly! 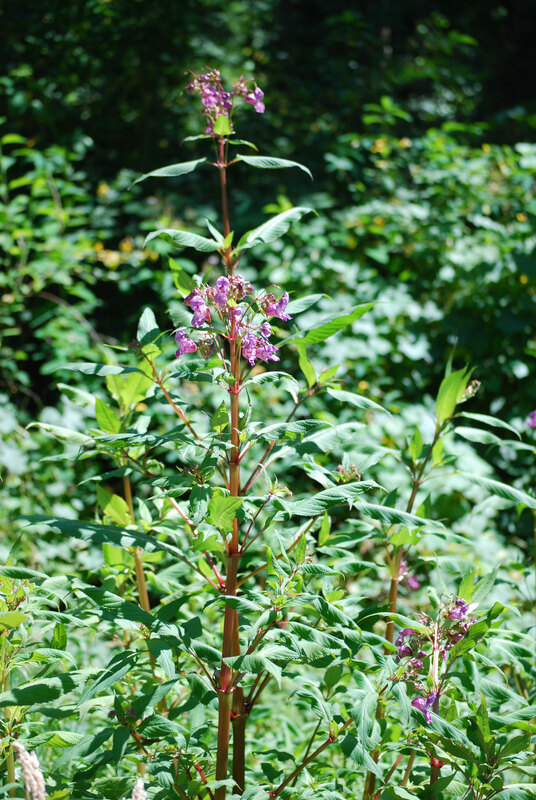 It displaces native vegetation along stream sides by forming tall, dense stands and shading out competing vegetation. Unfortunately, policeman’s helmet can have detrimental impacts on our streams and rivers. As an annual, when policeman’s helmet plants mature and set seed they die back leaving riparian soils exposed and unprotected. In our area, when the water levels in our streams begin to rise in winter the policeman’s helmet has largely disappeared, leaving behind nothing to prevent erosion or protect water quality. Exposed stream banks are more easily eroded allowing soils to move into the water column where they can cause many problems. They clog fish gills and fill in spawning grounds, increase water temperatures, and decrease dissolved oxygen. In the summer, policeman’s helmet may slow water flow, further contributing to increased water temperatures. Policeman’s helmet has a shallow root system and grows in moist soil so it’s easily pulled by hand, but be sure to remove the entire root. Pulled plants may be composted on site if flowers haven’t fully formed. Flowers and immature seed heads should be removed, bagged, and placed in the municipal waste. Do not pull or move through areas infested with policeman’s helmet when seed heads are popping! 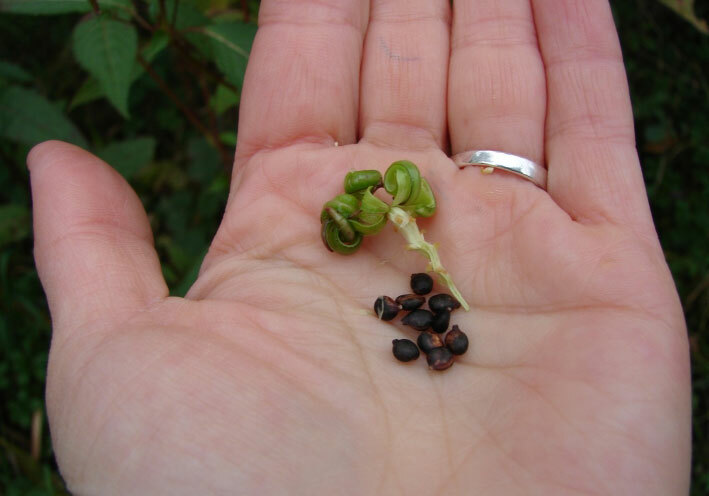 These annual plants die shortly after going to seed, and popping seeds can be dangerous and will spread the infestation. 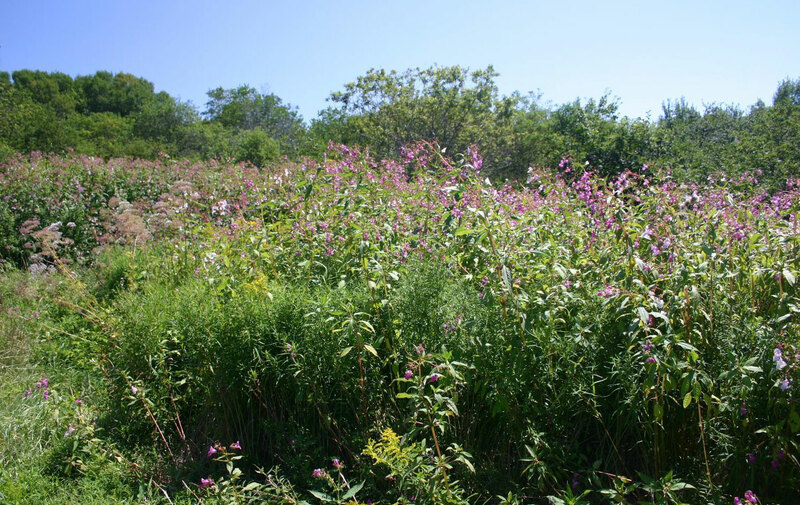 Have you noticed invasive policeman’s helmet in your area? If so, please report your sightings to the WeedWise program. You can contact us or submit your information online to the Oregon Invasive Species hotline. Your help in identifying and reporting locations of policeman’s helmet in our community will provide early detection information to the experts working to stop the next invasion before it starts!